A downsized tabletop easel, perfect for smaller work areas. With a quick flip, drawing panel changes from a chalkboard to a magnetic write-on/wipe-off surface that locks into place. Storage tray is ideal for storing markers, pens, and more. Adult assembly required. Includes 9′ paper roll. 17″W x 10.5″D x 20″H. 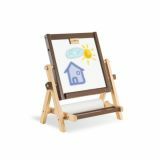 A deluxe easel features durable wooden construction and two work surfaces to be used by multiple children at once. One side has a write-on/wipe-off marker board with four no-spill paint cups; the other side has a chalkboard surface and a three-section chalk tray. Both sides feature child-safe paper cutters on the top of the easel and bottom paper supports. 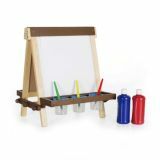 The center of the easel features a sturdy paper-roll holder and comes complete with an 18″ x 100′ roll of art grade paper. Folds flat for storage. Adult assembly required. Ages 3+. 26″W x 24″D x 45″H. 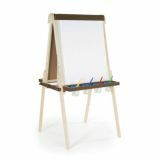 A wooden, double-sided tabletop easel has the same deluxe features as our floor easel in an easily portable, tabletop construction. Comes complete with a 12″ x 100′ roll of art-grade paper and 3 paint cups. Folds flat for storage. Adult assembly required. Ages 3+. 19″W x 17″D x 19.5″H.